Bullying is a life-and-death issue that we ignore at our children’s peril. It can no longer be minimized and trivialised by adults, taken lightly or brushed off, or denied. Thousands of children go to school every day filled with fear and trepidation; others feign illness to avoid being taunted or attacked on the way to school or in the school yard, hallways and bathrooms; still others manage to make themselves sick at school so as to avoid harassment in the locker room. Children who are bullied spend a lot of time thinking up ways to avoid the trauma and have little energy left for learning. The final diary pages of thirteen-year-old Vijay Singh. He was found hanging from the bannister rail at home on Sunday. Thursday: My body pouring blood. Extract from The Bully, the Bullied and the Bystander by Barbara Coloroso. 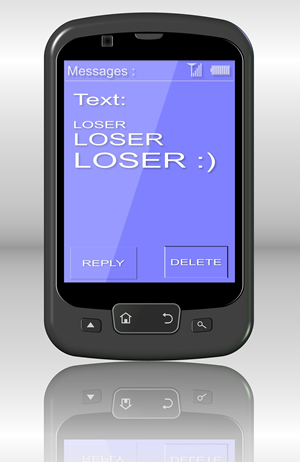 Cyber bullying has become more prevalent through the use of social media, email, instant messages, chat rooms and other digital messaging systems. What makes cyber bullying so dangerous is that anyone can practice it without having to confront the victim. You don’t have to be strong or fast, simply equipped with a mobile phone or computer and a willingness to terrorize.